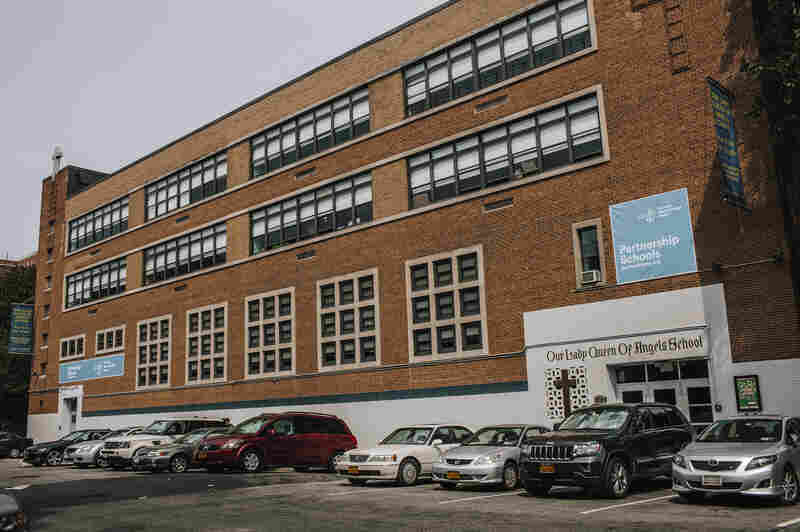 'It's All About Church Closings': Catholic Parishes Shrink In Northeast, Midwest Pope Francis is set to visit a Catholic school in New York City that used to have a sponsoring church. The parish was closed in 2007 in a region that has been a traditional Catholic stronghold. 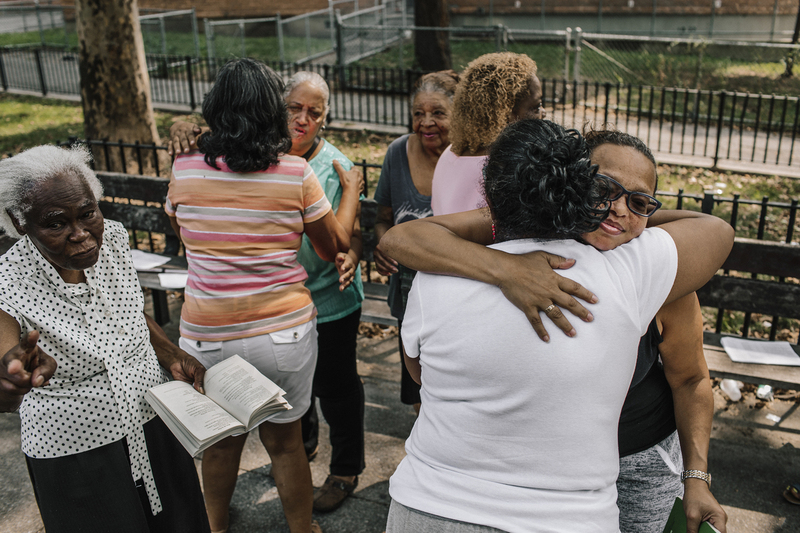 The church of Our Lady Queen of Angels in New York City's East Harlem neighborhood closed in 2007, but parishioners still congregate outside the parish for service every Sunday. On Sunday mornings, the church doors at Our Lady Queen of Angels are locked up tight. Cobwebs frame the rust red doorways. 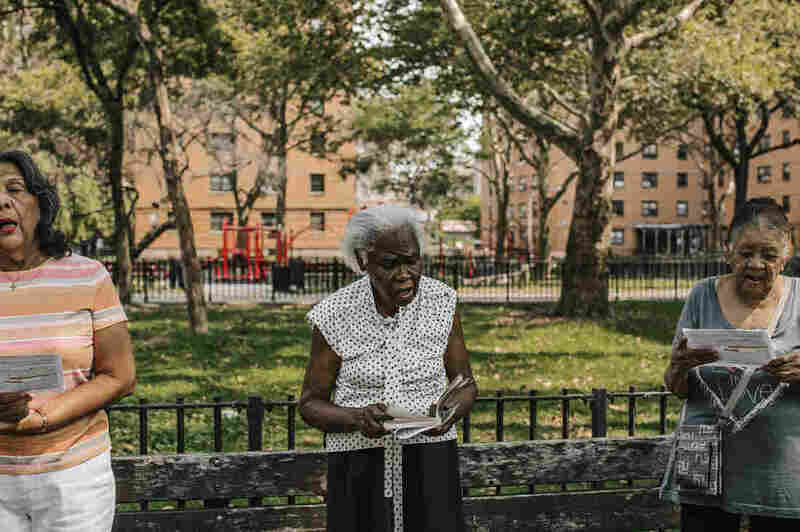 But just across this cul-de-sac, in the corner of a park in New York City's East Harlem neighborhood, the weekly Mass goes on. "This is our church. We're surrounded by trees, by the birds, the sky and very good-natured people. So no one can drag us out of here," says Margarita Barada, 91, sitting on a bench across from the closed church. She and a half-dozen faithful now meet without a priest. Eight years ago, New York's Archdiocese shut down Our Lady Queen of Angels as part of a reorganization that also closed dozens of other parishes. 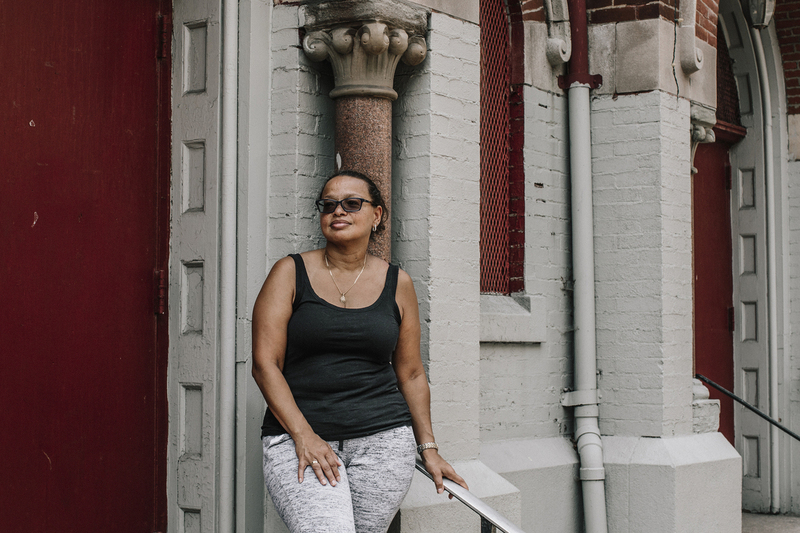 "You rarely hear of a church opening," says Patricia Rodriguez, 51. "It's all about church closings, and that's sad." Margarita Barada (center) reads a passage during a service in a park across from the church of Our Lady Queen of Angels in New York City on Aug. 30. Rodriguez was once led out of Our Lady Queen of Angels in handcuffs by the police after protesting its closing. Now, she leads the weekly services, which end with a prayer circle on the asphalt outside the church. "It's supposed to be our spiritual home. And so then where do you go?" she asks. That's a question facing many devoted Catholics across the Northeast and the Midwest, as the center of Catholic growth shifts towards the South and West. Since 1965, the number of Northeast parishes has dropped almost 19 percent, and the Midwest has lost more than 10 percent of its parishes — all while numbers in the South and West are growing. That's according to NPR's analysis of data from Georgetown University's Center for Applied Research in the Apostolate, also known as CARA. Patricia Rodriguez, a former parishioner and organizer of the informal Mass outside Our Lady Queen of Angels, stands in front of the church. She was once led out of the church in handcuffs by the police after protesting its closing. 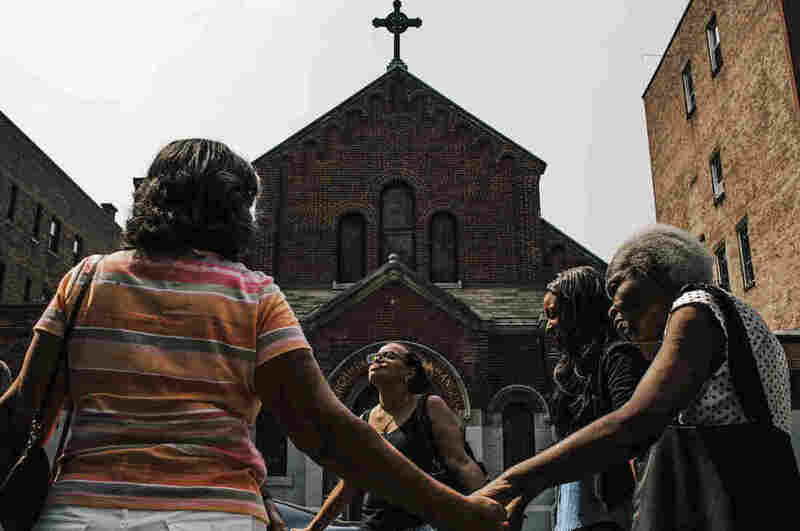 "You have beautiful structures in New York and Philadelphia and in Cleveland — all the urban areas that appear to be dying out," says Mary Gautier, a researcher at CARA who studies Catholic demographic trends. "The population is decreasing. The people that are in the pews are old, elderly and not being replaced by younger generations." There are young Catholics — but not in numbers large enough to fill the gaps left by previous generations of Catholic immigrants from Europe. Thomas Rzeznik, who studies the history of the U.S. Catholic Church at Seton Hall University, says parish closings picked up in the 1970s mainly because of money problems at many urban parishes. But then the Catholic Church faced a backlash. "The bishops and the dioceses were accused of abandoning the inner city and abandoning their mission," Rzeznik says. So, in more recent decades, Catholic church leaders have sometimes closed financially stable churches with congregations that are getting older and smaller. Rzeznik says it's a way to funnel parishioners and resources to struggling parishes in low-income communities. "They were some of the last stable institutions in areas that were struggling to cope with the loss of jobs, disinvestment and political marginalization," Rzeznik says. For many neighborhoods, losing a Catholic church meant more than saying goodbye to a house of worship. Rzeznik says some neighborhoods also lost social services and schools. Former parishioners of Our Lady Queen of Angels wish each other peace during a service on a recent Sunday morning. But that's not the case back in East Harlem. Though the church of Our Lady Queen of Angels closed in 2007, its school has stayed open since 1892. A couple years ago, New York's Archdiocese turned it over to the Partnership for Inner-City Education, a nonprofit group dedicated to Catholic education. "The very real threat that if we don't do right by these communities and if we don't do right by our students, that we might not live on for another hundred years. I think that's forcing us to really do better and pushing us to excellence," says Kathleen Porter-Magee, who oversees the school — and five others — as superintendent. Our Lady Queen of Angels School is still open, although its former sponsoring parish closed in 2007. Pope Francis is due to visit the school during his visit to New York City in late September. Thousands of Catholic schools in the Northeast and Midwest have closed over the past 50 years. But East Harlem resident Jessica Salazar, 33, is counting on Our Lady Queen of Angels School to succeed. "We have two daughters and a little 3-year-old that will be coming here, too," she says. This month, Pope Francis is also expected to come to this school — where almost 70 percent of students receive scholarships. "I'm very happy about those partnerships [between Catholic schools]," Salazar says. "It's exciting for low-income families, for people that don't work because it helps us bring them to the private school." And, she adds, it brings them closer to a Catholic way of life. With additional reporting by David Eads and Tom Gjelten.